(CNN) -- The U.S. Securities and Exchange Commission has charged businessman Robert Allen Stanford with orchestrating an $8 billion fraudulent investment program. 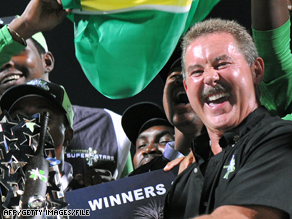 Stanford is the tycoon who bankrolled the Twenty20 Super Series cricket competition in the West Indies last year. The Texan has also contributed millions of dollars to the West Indies Cricket Board in an attempt to boost their flagging fortunes. Rose Romero, Regional Director of the SEC's Fort Worth Regional Office in Texas, said, "We are alleging a fraud of shocking magnitude that has spread its tentacles throughout the world." Stanford allegedly fabricated historical return data to prey on investors. The SEC says the investigation is on-going. Reuters.com reports three of Stanford's companies are involved in the SEC probe including Texas-based Stanford Group Co, Antigua-based Stanford International Bank and investment adviser Stanford Capital Management. The SEC Web site said Stanford International Bank CFO James Davis and Stanford Financial Group chief investment officer Laura Pendergest-Holt also face charges. It added that U.S. District Judge Reed O'Connor granted a temporary restraining order freezing the defendants' assets and appointed a receiver to marshal those assets, as part of a request for emergency relief for the benefit of defrauded investors. The SEC's complaint alleges that the fraud centered on a program in which Stanford International Bank promised "improbable and unsubstantiated high interest rates." SIB allegedly acted through a network of Stanford Group Company financial advisers to sell approximately $8 billion of "certificates of deposit" to investors. The bank boasted a unique investment strategy that it said allowed it to receive double-digit returns on its investments for the past 15 years, the SEC said. Early Tuesday, CNBC reported federal marshals were seen entering the offices of Stanford Financial Group in Houston. Reuters reported an eyewitness saw a sign taped to the window stating the company is now "under the management of a receiver." Stanford Financial Group could not immediately be reached for comment. According to the SEC's complaint, a close circle of Stanford's family and friends operates SIB. Its investment committee, responsible for managing the bank's multi-billion dollar portfolio of assets, includes Stanford; Stanford's father, who lives in Mexia, Texas; another Mexia resident with business experience in cattle ranching and car sales; Pendergest-Holt, who had no financial or securities experience prior to joining SFG; and Davis, Stanford's college roommate. The SEC alleges an additional scheme relating to $1.2 billion in sales. Stanford Group Company advisers are accused of using materially false historical performance data to create a mutual fund program called Stanford Allocation Strategy, the release said. According to the complaint, the false data helped grow the program from less than $10 million in 2004 to more than $1 billion, generating SGC - and ultimately, Stanford - about $25 million in 2007 and 2008. In the UK, the Press Association news agency reported that the England and Wales Cricket Board has ceased negotiations with Stanford, who was expected to become a major backer of a proposed tournament in England from 2010.